This wonderful, bizarre city is a marvel to me every day. The following story could not happen anywhere else. Imagine you’re Stephen Seemayer, my beloved husband of 30 years. You have little patience for slow baseball games (especially when the Dodgers are losing), and your team is behind, 4-2, in a game that — even though it has tons of action — seems to drag along at a snail’s pace. 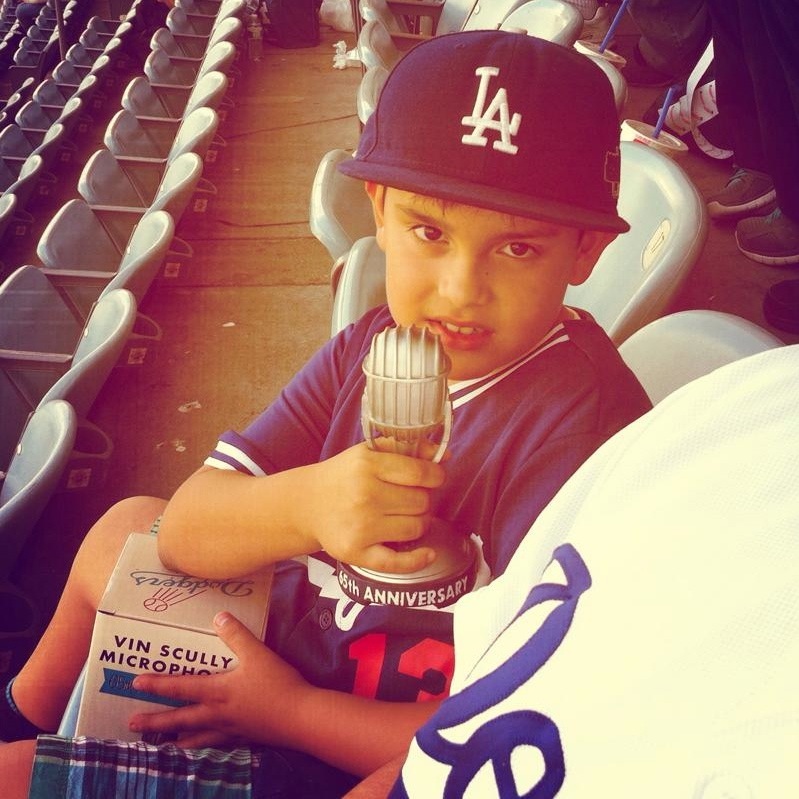 Young fan with his Vin Scully Anniversary Microphone. The highlight of this game before the 7th inning was the announcement that our cherished announcer, Vin Scully, will be back for his 66th season, which prompted, I kid you not, the longest standing ovation I have ever witnessed anywhere. Now imagine that the only thing keeping you from leaving the stadium is the possibility that Yasiel Puig might hit for the cycle. Then the magic happens. The Dodgers tie the score! Yay! The Dodgers take a three-run lead! Woo hoo! You stick around until the final bated-breath Kenley Jansen pitch: Dodgers 8, Braves 4. Blue euphoria! 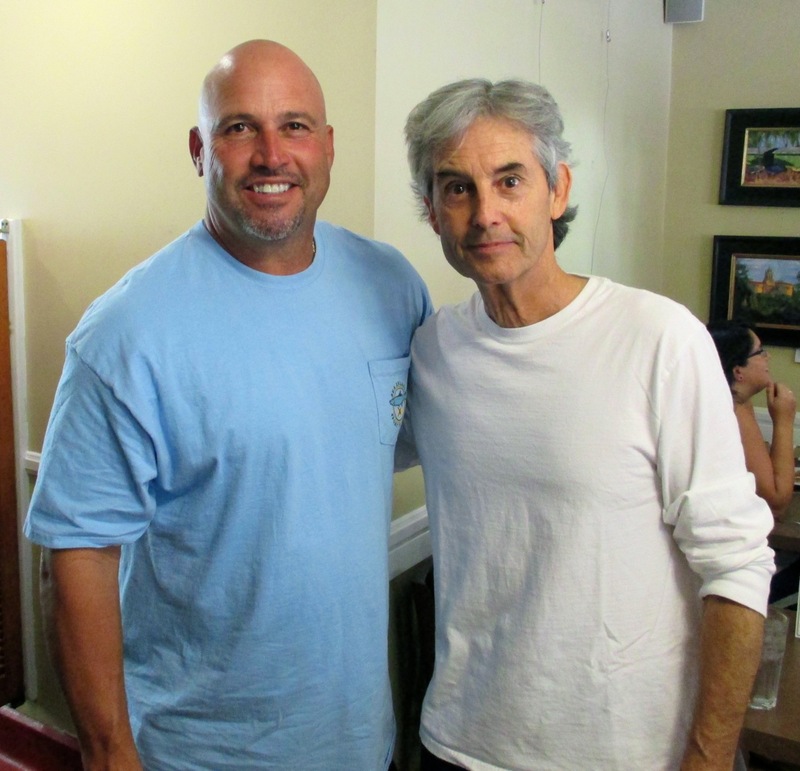 The next morning, you stop in a Pasadena diner to have a bite, there are no tables, so you sit at the counter, right next to Fredi Gonzalez, Atlanta’s manager. A bromance in the making. Hashing over the previous night’s game with the opposing team’s manager over oatmeal and wheat toast? If it were a movie, no one would ever be able to suspend their disbelief. But that’s not all! Gonzalez also just happened to be reading this morning’s Los Angeles Times cover story on the changing of the Arts District. After Steve introduced himself, Gonzalez did a double-take at the article’s jump, where there are numerous quotes attributed to one Stephen Seemayer. “Is this you?” the major leaguer asked, pointing to the paper. Then Gonzalez invited Steve to come over to the hotel and meet some of the guys. Too busy making movies and showing art and being quoted in front-page stories, Seemayer thankfully declined, but he might go down to the dugout before tonight’s or tomorrow’s game to say hello. Matt Kemp, rumored to be a trade target with Boston, accounted for half the Dodger runs last night as he hit a pair of two-run homers. He says he’s just trying to help his team win, but might he be trying to make the Red Sox more eager for him? 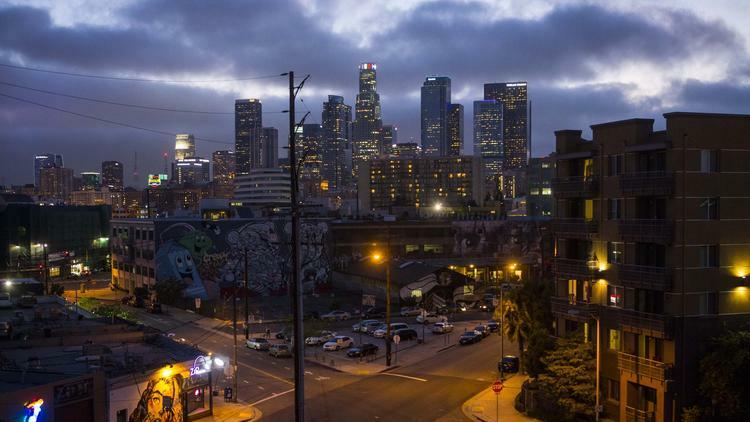 L.A. Times columnist Bill Plaschke was spot on in his assessment in today’s paper of the TWC-Dodgers fiasco that keeps 70% of Angelenos from watching the games. Writing that arbitration is the wrong way to resolve the issue, Plaschke quotes Dodgers President $tan Ka$ten as saying: “If you want to carry Dodgers baseball, this is obviously the way to do it.” To which Plaschke responds: “Really? The next time I plan to attend a game as a fan, would the Dodgers allow me to use an arbitrator to determine the price of my tickets?” Plaschke suggests, “Because it was the Dodgers who messed this up, why don’t they fix it themselves?” Perhaps renegotiating the deal, or kicking back a subsidy might be a start. But they are much too greedy for anything like that. Look for all the red in the stadium on Monday and Tuesday.